Railpictures.ca - A.W. Mooney Photo: I posted another image of this little caboose hop a couple of years ago, but the uniqueness of the operation deserves second look. Here are CN 70-tonners #30 and #40 returning to Charlottetown from Souris with their wooden caboose in tow. Like a scene from the steam days, this caboose actually has lantern markers on the end. The bridge is over the mouth of the Midgell River, as slow and peaceful as the Island itself. Beyond is St. Peters Bay, and beyond it, the Gulf. Despite the 60 lb (I think) rail, the little train really opened-it-up along this stretch of track; memory fails me but judging by the whiffs of exhaust they might have reached 25 miles per hour. It is a real shame railroading days like this are long gone, and I feel regret for not catching more activity on the Island, but in honest recall know I did the best I could in the time I had. Not much happened out there. I had gone down to the Shop in Charlottetown early morning to see what time the first train to Souris in 3 months (empty reefers for potatoes) was going to be leaving and it had already departed, pre-dawn. So I was able to meet it in Souris, and grabbed a few photos of it on the way back. I don’t know why I didn’t plan better, but like many of us amateurs of the day I allowed myself to run out of film. Mad dash to a store fetched me something called “3-M” rather than Kodak. It had to do. Actually, turned out not that bad. The camera, btw, was an old Pentax K-1000. CN 1750 and 1786 departed PEI by ferry with the last train on the 28th of December, 1989. Now, the old line is mostly the Confederation Hiking Trail. Still good enough to make me want to go back. The locomotives? Both #30 and 40 were retired by 1983, with #30 going to the rail museum in Delson, Quebec, in 1984. | Railpictures.ca – Canadian Railway Photography – photographie ferroviaire Canadienne. Caption: I posted another image of this little caboose hop a couple of years ago, but the uniqueness of the operation deserves second look. Here are CN 70-tonners #30 and #40 returning to Charlottetown from Souris with their wooden caboose in tow. Like a scene from the steam days, this caboose actually has lantern markers on the end. The bridge is over the mouth of the Midgell River, as slow and peaceful as the Island itself. Beyond is St. Peters Bay, and beyond it, the Gulf. Despite the 60 lb (I think) rail, the little train really opened-it-up along this stretch of track; memory fails me but judging by the whiffs of exhaust they might have reached 25 miles per hour. It is a real shame railroading days like this are long gone, and I feel regret for not catching more activity on the Island, but in honest recall know I did the best I could in the time I had. Not much happened out there. I had gone down to the Shop in Charlottetown early morning to see what time the first train to Souris in 3 months (empty reefers for potatoes) was going to be leaving and it had already departed, pre-dawn. So I was able to meet it in Souris, and grabbed a few photos of it on the way back. I don't know why I didn't plan better, but like many of us amateurs of the day I allowed myself to run out of film. Mad dash to a store fetched me something called "3-M" rather than Kodak. It had to do. Actually, turned out not that bad. The camera, btw, was an old Pentax K-1000. CN 1750 and 1786 departed PEI by ferry with the last train on the 28th of December, 1989. Now, the old line is mostly the Confederation Hiking Trail. Still good enough to make me want to go back. The locomotives? 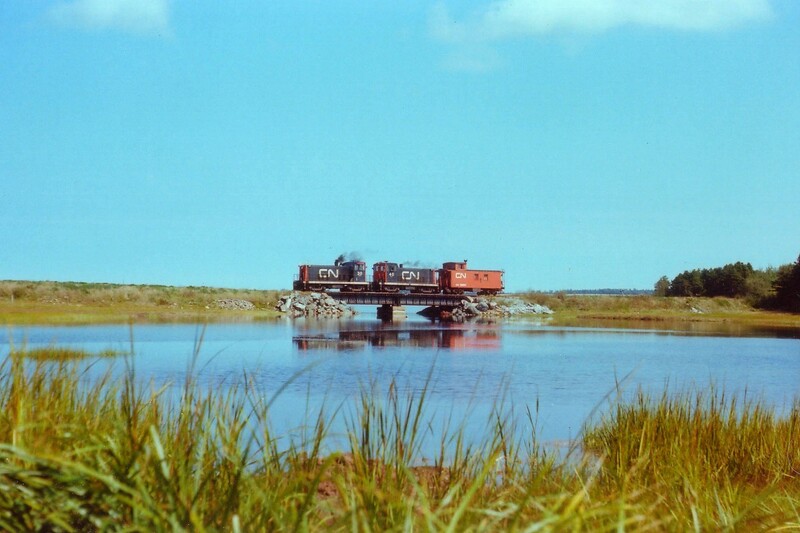 Both #30 and 40 were retired by 1983, with #30 going to the rail museum in Delson, Quebec, in 1984. Scenes like this we,ll never see again on PEI. This has always been one of my favorite pictures here on RPca – congratulations on your award, Arnold! Thanks, Mr. Steamer:o) Glad to know you are still lurking about on railpictures.ca. Great shot of some East coast Canadian rail history. Nice to finally meet you when I was down this summer Arnold. Congratulations! Arnold, We’ve performed our last round of editors choice voting and the Railpictures.ca editors voted this photo as one of our winners. Congratulations! Another slice of history grabbed by Mooney! Excellent shot and view. This is excellent, thank you for sharing Arnold.